Virginian Thomas Jefferson is credited with principal authorship of the document, with help from John Adams, Benjamin Franklin, Roger Sherman and Robert Livingston. The document affirms Congress' July 2 decision to part with Great Britain. To some, Jefferson's language sounds like a creed for future generations of Americans. Others wonder if his stirring words will apply to all Americans, or just those most directly served by the all-white, all-male, all-propertied members of the 2nd Continental Congress. 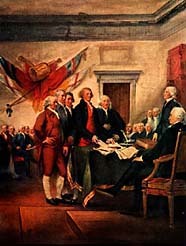 What is certain is that Congress has come a long way since it first gathered in Philadelphia in the fall of 1774. Few of its members then could have guessed that it was about to lead America into this decisive and seemingly irrevocable break with England. To a degree, Congress' hand was forced. Tension between British troops occupying Boston and the citizens of that city were bound to erupt, as they did a year ago last spring at Lexington and Concord. A subsequent engagement at Bunker Hill made it doubly hard to "uncross the Rubicon." The King himself seemed to be encouraging a fight. A final Congressional entreaty to peace last year was answered in cold language by George III. "The lines have been drawn," he wrote. "Blows must decide." Still it took a wildly successful pamphlet by unknown writer, Thomas Paine to push the collective consciousness toward independence. Common Sense spoke in plain English to the hundreds of thousands of Americans who read it. "We have it in our power to begin the world anew," Paine wrote. By the spring of this year, the idea of independence had caught fire throughout the colonies. Royal governments were ousted one after another up and down the eastern seaboard, and colonial assemblies began drafting their own constitutions. The idea of freedom seem to intoxicate everyone. Americans are now faced with the consequences of their action. British troops have withdrawn from Boston and are said to be on their way to New York. General George Washington and the Continental Army are marching there to greet them. Only time will tell whether the force of Jefferson's language will be matched by American force in the field.